Estate of Franz Kline; (David McKee Inc., New York); purchased 1979 by Edward R. Broida, Los Angeles; gift 2005 to NGA. 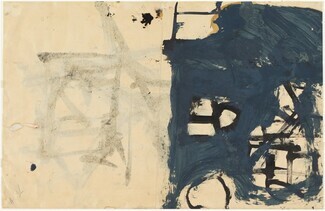 Drawings by Franz Kline, David McKee Gallery, New York, March 9 - April 20, 2002; Museum of Fine Arts, Houston. Selections from the Collection of Edward R. Broida, National Gallery of Art, Washington, 2006, unnumbered brochure. Medieval to Modern: Recent Acquisitions of Drawings, Prints, and Illustrated Books, National Gallery of Art, Washington, 2008, no. 185 2. 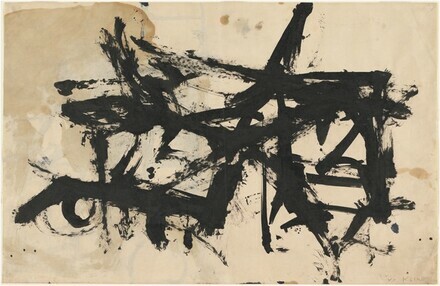 Franz Kline: Coal and Steel, Allentown Art Museum, Allentown; Sidney Mishkin Gallery, Baruch College, The City University of New York, New York, 2012 - 2013, unnumbered catalogue. Mattison, Robert S. Franz Kline Coal and Steel. Allentown, PA, 2012: p.72, 75 illus., 110.